Through 2018, top academic journal articles identify 382 factors (see the chart below), materially reusing the same source data. Moreover, there are likely many (“file drawer”) factor studies discarded because of negative findings unlikely to be accepted for publication. Such multiple testing (data snooping) degrades statistical significance through discovery of factors that are simply lucky in the available sample. For example, one of 20 insignificant factors tested on the same data is likely to achieve conventional (5% level) statistical significance by luck. There are several ways to correct for multiple testing that increase the statistical significance threshold with the number of tests. However, it is arguable that thresholds for factors derived from careful theory should be lenient compared to those discovered by brute force experimentation. Finally, academic factor studies routinely ignore trading frictions, such that their findings are for “gross” factors, not “net” (practically exploitable) factors. Accounting for reasonable trading frictions has an effect similar to that of raising the statistical significance threshold, with disparate impact on factors with different turnovers and dependencies on the contribution of small stocks. 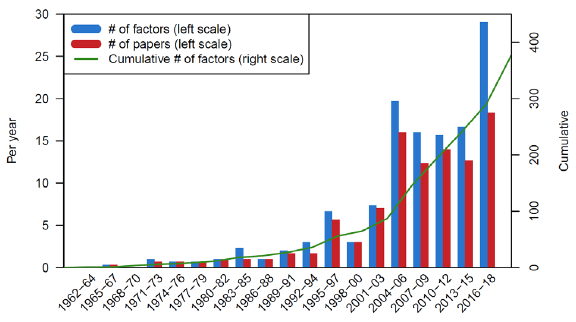 The following chart, taken from the paper, summarizes the rate of publishing of new equity factors in top academic journals and cumulative number published through 2018. Through 2018, the number is approaching 400 factors, with the preponderance discovered after the early 2000s. This count does not include those factors appearing only in working papers or those discarded as uninteresting during the search process. All discoveries/discards contribute to data snooping bias. In summary, equity factor research in aggregate overstates investment return expectations. Stock and equity style pickers should be skeptical of academic underpinnings of their beliefs. As noted in the paper, the number of equity factors identified in published research understates data snooping, arguably by a lot. The paper focuses on U.S. equity factors because most relevant research does also. Snooping of factors for other asset classes may be less severe, but the case for skepticism is similar. See also “Inflated Expectations of Factor Investing” and the results of this search.